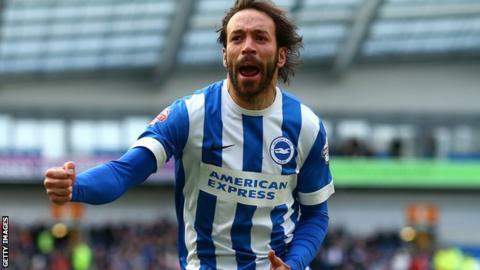 Inigo Calderon hopes he can help Brighton avoid relegation and sign a new deal with the Championship club. The 33-year-old defender, who joined the Seagulls in January 2010, is out of contract at the Amex this summer. "I have been here five years and I have really enjoyed every single day," the right-back told BBC Sussex. "We are not having the best time this year but I am learning a lot. I want to keep the club in the division and hopefully stay here." Calderon was signed by former Brighton manager Gus Poyet and is the club's longest-serving current player. The former Alicante and Alaves player has scored 19 goals in 210 appearances for the Sussex club and was voted as Brighton's player of the year by supporters on Monday. Calderon helped Brighton to secure top-six finishes in the last two seasons but, with two games of the current campaign remaining, Albion are not yet safe from relegation. They are six points above the bottom three but 22nd-placed Millwall have a game in hand. Should the Lions lose at Blackburn on Tuesday then Brighton will be virtually guaranteed a place in the second tier next season thanks to their superior goal difference. "We have been doing really well in the last three years. Sometimes it is not so easy and hopefully we will be back there again," Calderon added. "I was thinking about going to Blackburn to cheer on Rovers. "I will be looking at the results, otherwise it will be in our hands against Watford at home on Saturday. "I'll take it [survival] any way but I'd like to finish in a good way. The fans deserve to have something good because it has been a bad season for them."